Thinking about adding a (rose) gold chronograph to my collection. Breguet has 2 options I like, Marine Chrono or Type XXI. Can anyone provide some thoughts and guidance (and pictures). Why the price difference? How are the movements and performance? Thanks. Well, both are very nice. They have similar movements, but not exactly the same. I'd say the Marine 5827 chronograph has an open caseback with better movement finishing and a guilloched gold rotor, plus of course the solid gold dial, again hand guilloched and silvered, with gold hands and markers. That might be part of the price difference, although pricing of watches is done according to what the market will bear, plus whatever mysterious veblen goods formula for things like these. I have the wg Marine Chronograph and I love the blued hands and markers. However, the rose gold is lovely and it comes in two different dials. The first is black rhodium finish over the gold guilloched dial, and the second is a silvered dial. It's hard to tell from this picture, but the 42mm Marine chrono fits my 6.75" wrist perfectly, the lugs don't quite reach the borders of my wrist. Ask user short's home about the XXI as he has a great collection. Thanks, I actually followed your lead and bought the WG Marine 5827 chronograph. White gold was less flashy and seemed like I would use it more often. Loving it so far, it hasn't left my wrist for days. Maybe someday I will get a Type XXI in RG or steel to complete the set. Love the quality and finishing of a Breguet and the amazing guilloched gold rotor and dial ... makes you feel like you are getting something for all that money! 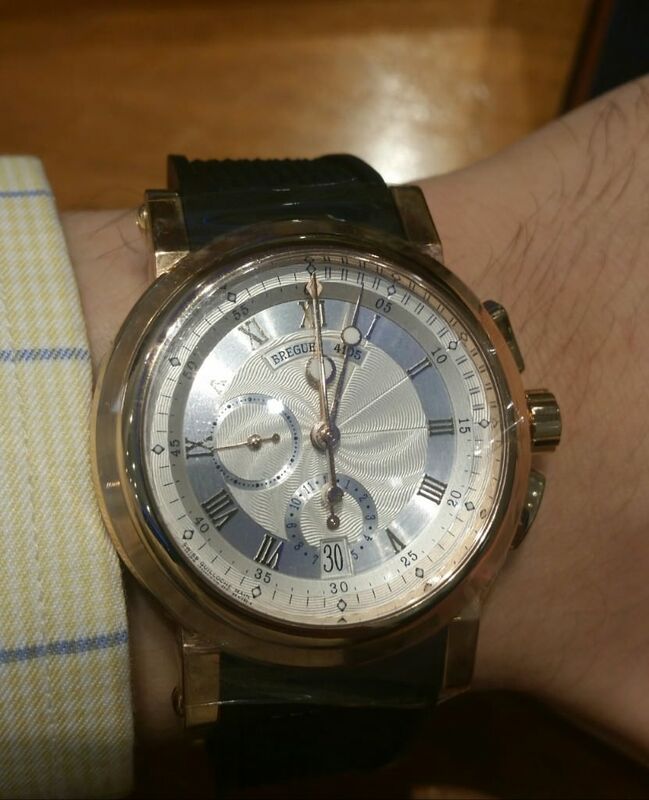 A gold Breguet for same/less $ than a steel AP, VC, etc. seems good to me. Been traveling so didn't have a good opportunity to reply, but you got good advice! The wg Marine chrono is really lovely. The blued hands are just alive in the light and the guilloche is fantastic. The watch looks magnificent with the leather strap and can handle the wettest day with the rubber (or the pool, just make sure the crown is screwed down). I even bought the dark blue rubber strap for it and it's very nice on that as well. Thanks, it came on the black leather strap but also bought the dark blue rubber and am using the rubber strap for now. I used to have a AP ROO chrono and am liking this better, slimmer, more elegant, more versatile, and the weight of the gold feels nice.